This goes back a couple of months but it bugs me, so I'm documenting it. The ARC now recommends performing a series of backblows; if that fails to remove the obstruction, rescuers should then proceed with "abdominal thrusts." "The Red Cross teaches not the Heimlich maneuver anymore. They call it the abdominal thrust. This is probably the most important thing I have to say. The Heimlich maneuver is putting your fist above the belly button -- you can even save yourself -- but below the rib cage and pressing inward and upward. And what that does is it pushes the diaphragm up which compresses the lung and causes a huge flow of air that we've measured, that simply carries the object out -- it can only go in one direction and it comes completely out. An abdominal thrust -- not only doesn't it save a life because it doesn't push the diaphragm up but it causes deathly injuries -- a ruptured liver or spleen or something of that nature. So it's extremely important that you do the Heimlich maneuver and not the abdominal thrust." Is there a difference between the "Heimlich maneuver" and abdominal thrusts as taught by the ARC? So I e-mailed Radel and asked if the Enquirer intended to inform its readers he had provided a platform for the erroneous ramblings of an almost 93-year-old man who reportedly lives in a retirement community. I also asked Radel why his article failed to inform readers that the ARC's "backblows-before-Heimlich" update happened in Spring 2006 and if he asked my father why he'd waited almost seven years to make a fuss. In other words, why was Radel's front page story newsworthy? 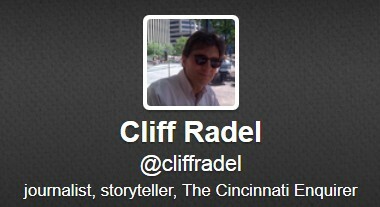 Cliff isn’t able to do further reporting to answer your questions; he needs to move on to other things. Essex also wrote me that he joined the Enquirer in June of last year, so he wasn't on board for Radel's previous rah-rah article that ran on April 12, 2012, Young students soon to become Heimlich Heroes. Why is the Enquirer -- the newspaper that in Spring 2003 ran front page articles exposing my father as a "liar and a thief" and for conducting medical atrocity experiments on Chinese AIDS patients -- now apparently trying to rehabilitate his reputation?